Preethaji is a modern day Indian philosopher and sage who has co-founded along with her husband Krishnaji the O&O Academy and One World Academy (schools to revolutionize and transform human thought), World Youth Change Makers (an elite community of youth redirecting the future of the world through a revolution in consciousness), and One Humanity Care (a Foundation working with the vision to uplift 10,000 villages in India). She established OWA Foundation a non-profit charitable foundation, which has to date offered life education to 150,000 children, young people and to many of their parents and teachers in India. The foundation also supported Udavum Karangal, a local orphanage with more than 3000 residents with regular food supplies, and education for 100 children. She has designed profoundly transformative meditations and processes that form the core of the experience of Ekam or The Oneness Field – Asia’s largest marble pillarless hall, an architectural marvel built to impact human brain and consciousness and thus hasten the process of world transformation. She is also the Co-Founder and Vice Chairperson of White Lotus Conglomerate, a successful business that spearheads the creation of residential, commercial and hospitality space. Preethaji was born on 2 December 1974 to Rama Bhagavaddasa and Lakshmikara. She has an elder sister with whom she shares a close friendship and many beautiful memories. When she was eight years old, Preethaji was struck by the awareness that those around her did not seem to experience the state of compassion that was inherent in her. She realized that most people lived their lives with a painful sense of disconnection. A naturally brilliant student, she effortlessly completed her schooling and Bachelors in Commerce (Ethiraj College, India), where she was awarded a state rank in accountancy. She then went on to receive her Masters, in both Business Administration (University of Queensland, Australia) and Philosophy(Kamaraj University, India). Preethaji is the Co-Founder and Vice Chairperson of White Lotus Conglomerate and primarily directs its financial operations. Her guidance and insights centre the group in integrity, responsibility and has led to a phenomenal rise in its growth chart. 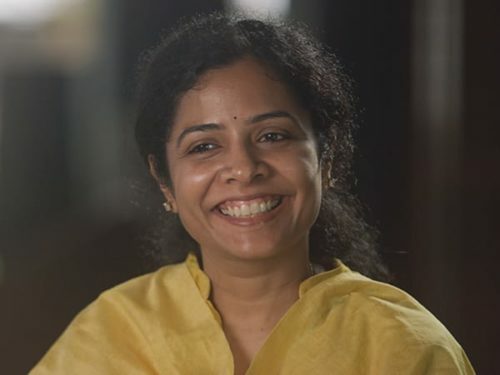 Along with Krishnaji, she approves and shapes the conglomerate’s strategy, reviews its growth and guides in the over-all direction of the company. Preethaji has been the vital driving force of White Lotus. She also directs Kosmik Music and Kosmik Global Media, a media conglomerate recognized for its award-winning wild life documentaries featured on the Animal Planet, National Geographic and Sony. Kosmik Global Media is an established production house specializing in a broad range of factual content, natural history documentaries and feature films. The productions have won awards such as Winner of Best Film on Forest and Wildlife at the Woodpecker Festival in 2014, Winner of Best Film on Science and Technology in 2013 at the 61st National Film Awards given by the President of India, Winner of the Best Cinematography Award at the 3rd Jaipur International Film Festival January in 2011. From a very early age, Preethaji was gifted with an ability to deeply feel and connect to the sorrows and joys of others. In her words, “I believed this is how all human beings were. It is only when I was 8, that I realized for the first time that most of humanity actually lived with a very strong sense of self that made them feel separate and disconnected from the other. It was deeply unsettling for me and I found myself wondering ever since, how to turn this around and help people experience true spiritual connection.” She had her first transcendental spiritual experience at the age of 17, one that she credits as being a very significant milestone on her path to emerging into a spiritual teacher. Preethaji is married to Krishnaji since 1996 and they live together with their daughter Lokaa in Chennai, India. Amidst all the immense success in the world of business, Preethaji has remained a philosopher at heart. Her priority has always been the vision to transform humanity with her deep spiritual insights into the nature of human suffering and awakening them to the oneness of all life. Preethaji is the daughter-in-law of well-known Indian spiritual teachers, Sri Bhagavan and Sri Amma, the Founders of Oneness University and Co-Founders of O&O Academy. A series of powerful spiritual experiences & insights in 2009 led to the founding of One World Academy, a wisdom and meditation school for transformation – with a vision to end human suffering and help individuals live in a beautiful state. For Preethaji, a beautiful life is one that is lived free of suffering, a life that is lived with a larger purpose, and one in which the well being of the world is included. Her life stands a testimony to this. Preethaji has developed a series of spiritual courses & meditation practices that are aimed at helping individuals, groups and corporations live and function from a beautiful state. In 2010 she also initiated OWA Foundation, a non-profit charitable organization, which offered life education to more than 150,000 children and young people. In the year 2017, she co-founded O&O Academy along with her husband Krishnaji and the Founders of Oneness University Sri Bhagavan and Sri Amma. O&O Academy is a spiritual school with a vision to awaken humanity to a state of ‘One-Consciousness’ – where they transcend all forms of separation and experience oneness with all that is. Preethaji mentors the team of faculty at the O&O Academy campus, India. She also mentors the One consciousness Trainers and One Consciousness Transformers across the world. She has designed several courses, meditations and seminars that are now offered by the Faculty, Transformers and Trainers of the Academy, both on campus and worldwide. Preethaji herself travels across USA, Europe, UK, Australia, and Asia offering her signature weekend program, “Being Limitless” and a four-day retreat “The Beautiful State”. In her presence, students and seekers sense a rare enlightened sage, who impacts her students not only through her wisdom, but also the power of her consciousness. She has taught leaders and at organizations including Tedx at Kansas City, Opera Winfrey’s OWN; Ari Emmanuel’s WME-IMG annual convention, and the High Performance Symposium organized by Equinox. Learning from Preethaji is indeed a true blessing. It is awakening to a new consciousness, a new life and the power to create a new world. Citation: Vinoth “Preethaji Biography” www.biographyonline.net. Published 7 June 2018.